This straight-forward 5v5 possession passing drill provides you the opportunity to focus on several specific areas of opportunity for your team. 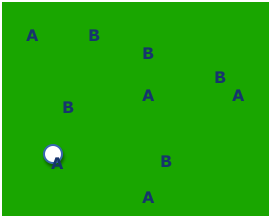 - Set up this 5v5 possession game using a 30 x 40 yard grid (adjust for success). - Split up players into teams of 5. - Players play keep away within the grid. - Player movement must be constant, looking to find space and good supporting angles. - Players must communicate constantly. - By keeping teams with even numbers, it forces players to work both offensively, and defensively for their team to have success. - When receiving the ball the 1st touch should allow player to open up to the entire field of play, not restricting any passing option. - Play elimination, for every turnover that player becomes eliminated from the drill until 10 straight passes have been made. - 10 minutes for this 5v5 possession passing drill.